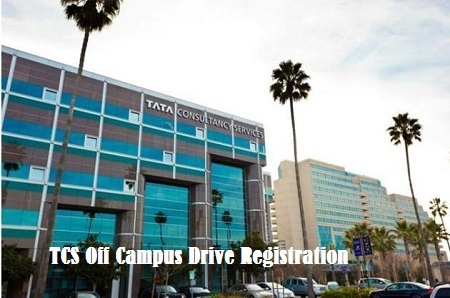 TCS Off Campus Drive Registration: Almost everyone of us want to be a part of the work culture of TCS. So, here comes the opportunity, which invites all the upcoming freshers batch of 2019 for an Off Campus Drive. Interested candidates can register for the same. It is being conducted across India. 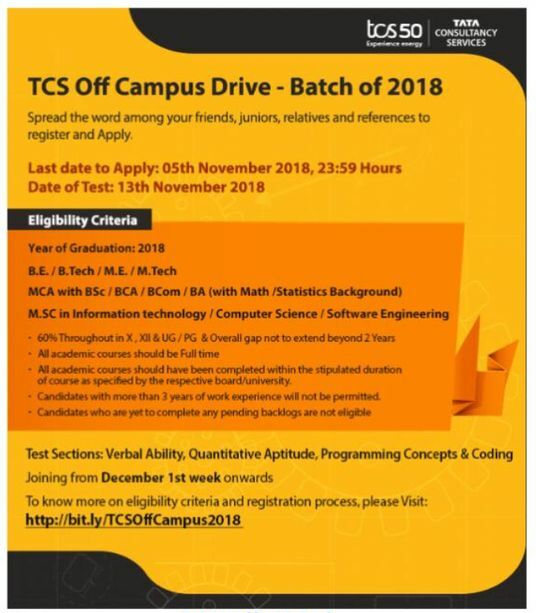 You will find Proper details about TCS off campus drive for 2019 batch in this page. Candidates who have completed their professional degree in 2018 or 2019 only. The candidates who have passed full time programme like B.E/ B.Tech/ M.E/ M.Tech/ M.Sc/ MCA in 2018 or 2019. Any stream of engineering student can apply. Max 2 years of gap in academics are allowed. Backlog students are not allowed to appear in this IT giant drive. A candidate should have minimum aggregate of 60% through out 10th, 12th, Diploma, UG and PG. If you have more than 3 years working experience then you will not be allowed in this recruitment process. Note: If you have appeared in on campus or TCS Ninja Test for 2019 batch then you have to wait for 6 months. Here you will also get to know about the company brief and how to register yourself for the off campus drive. Tata Consultancy Services is one of the vast organizations of India spread across all the industrial cities. It is known for the work taht they do in helping customers achieve their business objectives by providing innovative, best-in-class consulting, IT solutions and services and to make it a joy for all stakeholders to work with them. The company operates on a global scale, with a talent diversity of more than 389,200 associates. It includes 133 nationalities across 45 countries. It is supposedly the largest employers of women with 35% women employees.The Top Employers Institute rated TCS as an exceptional performer across nine core Human Resources (HR) areas: talent strategy, workforce planning, on-boarding, learning and development, performance management, leadership development, career and succession management, compensation and benefits and company culture. 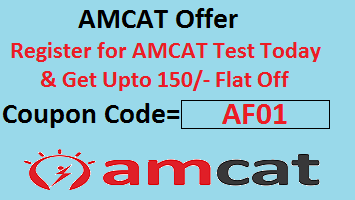 Grab opportunities in 2000+ companies apply through AMCAT Coupon Code. You need to open the following link to start the registration process. Once you click on register, you will be asked about the technology that you want to apply for. There are basically two of them-IT(Information Technology) and BPS(Business Process Services). You need to fill up this part very carefully and thoughtfully, otherwise you will have to repeat the whole process of registration again. Fill all the mandatory fields asked in the form properly. It will not be editable once the form is submitted. You will get an mail from fresher.recruitment once the registration number is generated. With the help of Registration number and password, you can login and check in the name of registered candidates. Unless the application is in Application received status, you should keep a track of the submitted form. You will get to know about the venue and other details, once application is successfully processed and selected for further evaluation. If any issue comes as such on TCS Off Campus Drive Registration, you need not panic, just call the help desk and tell the issue. They will resolve it soon. Follow up with the other subsequent informations. Feel free for any comments and questions TCS Off Campus Drive Registration. We are exploring TCS off campus drive in detail here, so be updated with us for latest updates like exam pattern, syllabus, mock test, interview questions, placement papers, aptitude questions etc. All the very best for TCS Off Campus Drive. iwant job in tcs for good future.